In control of my Life, thanks to Unnati! ‘Dont wait for the perfect moment; take the moment and make it perfect’–An anonymous quote on Life. Speaking to Unnati alumni is always an enriching experience, and when the student is from one of the earlier batches (3 years past or earlier), one gets more anxious not knowing what surprise awaits us in the conversation! The discussion with Raghunandan was one such experience. To start with, I felt I was speaking to a colleague. There was a lot of confidence in demeanour and clarity in communication, a personality transformation made possible by Unnati! Raghunandan hails from Doodaballapur in the outskirts of Bangalore. His father is a tailor and his mother, a home-maker. He has 3 sisters, one elder, who is married now, and 2 younger, who are now working after completing their graduation. When Raghunandan joined Unnati in 2009, his younger sisters were still studying. Raghunandan’s early years were a struggle with the mediocre income his father brought home. Financial struggles meant that Raghunandan had to quickly support the family. He was pursuing a Bachelor’s degree in English that he could not complete. All through school, he studied in the Kannada medium, which made it difficult for him to cope up during his undergrad years. This struggle, compounded with the financial struggle at home, made him feel depressed. It is at this point that Raghunandan read about Unnati in a newspaper article. He immediately decided to join the 16th batch at Unnati and chose the BPO vocation. Training in communication skills. 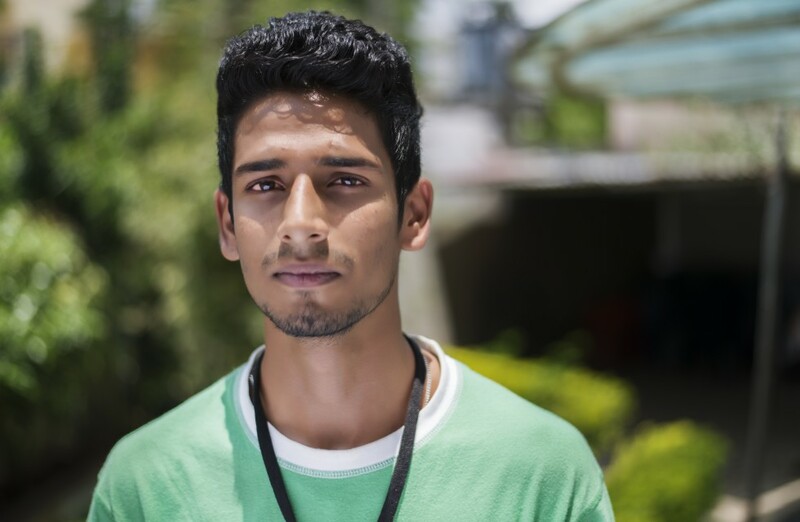 Even with a Bachelor’s education in English, he was unable to speak with the fluency that Unnati helped him with, in 70 days. Boosting one’s Confidence levels: The Unnati life has helped him shape and reshape his career multiple times, each of them successfully. Friendly and approachable staff. Unnati staff lead by example. He says he has learnt how to approach life with positivity, thanks to learning from the faculty and other staff at Unnati. Raghunandan’s first job was at Mphasis BPO. He started off with a salary of Rs. 78000 per annum, and this was back in 2009. 8 months into the job, his family went through a crisis and Raghunandan had to rush home. Back home, he realized that he could not come back, at least immediately, to his regular job. He says the confidence Unnati gave him helped him a great deal at that time. He just grabbed the moment and the opportunity to run his dad’s tailoring business, and did it with élan. He pursued a tailoring course, had a team of few tailors and grew that business well. Luck sometimes gets the better of you! When he was thriving well in the business, there was a new crisis in town and he had to scale down operations. Again, as Raghunandan mentions, the Unnati positivity told him that he could come back to Bangalore and start afresh. He did that. Raghunandan joined SLK BPO services as a fresher back in 2013. He did well in his job and was very successful. He then noticed an internal job posting, and applied for a HR position in SLK’s IT division. His communication and confident approach gave him that core HR job as well. Raghunandan now earns an average of 2.4 lakhs a year, including incentives, and is very happy about where Unnati has taken him in life! He mentions that the Unnati training and the trainers are God’s gift and should be treasured! We at Unnati are so happy about Raghunandan’s progress, about how he’s been able to make every moment of his life successful and perfect. Congratulations Raghunandan, and wish you the very best!! Previous Post Exciting Results from GiveIndia’s Survey of Unnati Students!